The Spanish composer and pianist Enrique Granados contributed significantly to the creation of a national Spanish music. His best-known work is the piano suite Goyescas. Enrique Granados y Campiña was born in Lerida, Spain, on July 27, 1867. After his family moved to Barcelona he took piano lessons from Francisco Jurnet and Joan Baptista Pujol. In 1883 he began to study composition with Felipe Pedrell, composer, musicologist, and passionate champion of Spanish folk music, who introduced Granados to the principles of musical nationalism. In 1887 he went to Paris, where he studied piano privately with Charles de Beriot, one of the leading professors at the Conservatoire. He returned to Barcelona in 1889 and gave his first recital there the following year. This successful debut launched the concert career that eventually earned him an international reputation. Despite the demands of performance, he also composed and taught piano. Among his most distinguished early works for piano are the Danzas espanolas, 12 pieces gathered into four sets written in the 1890s. In these pieces— much admired by Massenet, Cui, Saint-SaÃ«ns, and Grieg— Granados incorporated elements of Spanish folk dances in a most distinctive and personal way. Of these deservedly popular dances, the fifth in E minor is the best known. Granados' first major success as a composer came in 1898 with the production of his opera Maria del Carmenin Madrid, for which he was honored by the king. He wrote four other operas which were produced in Barcelona, but they met with little success. In 1901 he established his own piano school, the Academia Granados. 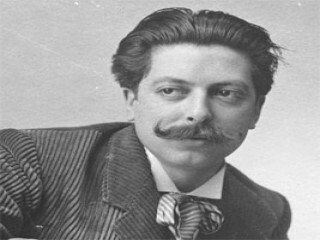 Granados' most celebrated work, the piano suite Goyescas, received its first performance in Barcelona on March 9, 1911. It was a great success. When Granados played it in Paris on April 4, 1914, it was given an equally enthusiastic reception. Soon after, he was elected a member of the Legion of Honor and was asked by the Paris Opera to turn Goyescas into an opera. The operatic version, with a libretto by Fernando Periquet, was accepted by the Opera, but the outbreak of World War I put an end to plans for its production. The Metropolitan Opera took it over, and it had its world premiere in January 1916 in New York. Granados came to the United States to supervise the production and to attend the premiere. Despite the favorable response of the audience and critics, the opera did not sustain interest and never found a place in the operatic repertory. Granados' trip to the United States ended in tragedy. Invited by President Wilson to play at the White House, Granados delayed his return home. Instead of taking a boat directly to Spain as he had planned, he went first to England and there boarded the Sussex for Dieppe. On March 24, 1916, the Sussex was torpedoed by a German submarine in the English Channel. A survivor reported that Granados was safe in a lifeboat when he saw his wife struggling in the water. He jumped in to help her, and they both drowned. Shortly before he died Granados had written to a friend, "I have a whole world of ideas. I am only now starting my work." These ideas were never to be realized. Despite his early death, Granados left a sizable body of works. But he is remembered today chiefly for Goyescas, Danzas espanolas, and his Tonadillas, songs for voice and piano. Goyescas, subtitled "Los majos enamorados" ("The majos, or gallants, in love") consists of six pieces in two books. The title Goyescas means "in the manner of Goya" or "after Goya." Each of the six pieces is a musical evocation of a painting or etching by Francisco Goya, the famous 18th-century Spanish painter. Granados was totally captivated by the painter and his works, especially by his paintings of the "majas," those beautiful, mysterious aristocratic Spanish women with their mantillas and fans. In these pieces Granados brilliantly blended the stylistic and technical elements inherited from Chopin, Schumann, and Liszt with Spanish melodies, rhythms, and colors to achieve a highly individual, poetic musical expression. Frank Marshall, a pupil of Granados and the teacher of Alicia de Larrocha, wrote: "Granados manages to capture all the elegance, subtlety and aristocracy of eighteenth-century Spain. He stylized, formalized and polished the folklore of his music." Technically the pieces are fraught with difficulties—rich, quasi-orchestral textures, wide stretches, numerous countermelodies, and much ornamentation. Of the six pieces the most famous is the fourth, Quejas, Ã³ la maja y el ruisenor (The Complaint, or The Maja and the Nightingale). It is followed by the first piece of Book II, El amor y la muerte (Love and Death), the most brilliant and dramatic of the set, in which Granados recalls themes previously heard in Book I. El pelele (The Strawman), although not published as part of the Goyescas, is usually appended to it. In performance it is played as the seventh and last piece. It is based on the music of the opening scene of the opera Goyescas, in which a "strawman" is being tossed in the air by the "majas." Ernest Newman, the English critic who in 1917 called Goyescas"the finest piano music of our day," summarized the work's special quality and appeal: "The music, for all the fervor of its passion, is of classical beauty and composure. The harmony is rich but never experimental. The melodies have new curves, the rhythms new articulations. Informing it all is a new grace, a new pathos, a new melancholy … but, above all, the music is a gorgeous treat for the fingers, as all music that is the perfection of writing for its particular instrument is. It is difficult, but so beautifully laid out that it is always playable: one has the voluptuous sense of passing the fingers through masses of richly colored jewels…. It is pianoforte music of the purest kind." View the full website biography of Enrique Granados.